What are we going to do to change this decline? The estimates are that the three-state Chicago metropolitan area lost 19,570 people in the year ending last June 30, dipping to 9.513 million. That's bigger than the drop of 11,324 people the year before, according to the bureau. The region did gain a little bit since the last census in 2010, moving from 9.461 million then. But the increase of .4 percent is a small fraction of the hike in the same period by large peer cities like Los Angeles (up 3.6 percent), New York (+2.8 percent) and San Francisco (+7.7 percent). However, Chicago's decline last year and small rise over the past six years is roughly similar to that of other big Midwestern cities, lagging the Minneapolis/St. Paul area and Indianapolis, but ahead of Cleveland, Detroit and St. Louis. Even so, all of them did better than Chicago in the last year alone. The metro area declines are heavily concentrated in Cook County, but show signs of spreading to outlying counties, too. For instance, the bureau estimates that DuPage County lost 3,000 people in the past two years, and that Will and Grundy Counties had small population losses last year. 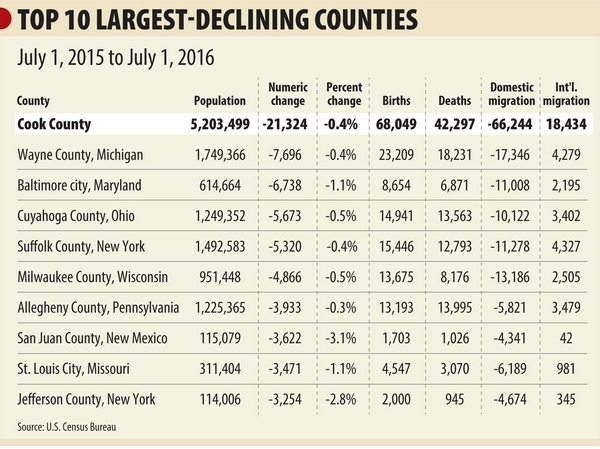 Though the percentage drop was more elsewhere, the numerical population of Cook County dropped more last year than in any other county in the country, according to new U.S. Census Bureau estimates. The bureau did not break down the data by municipality, so it's impossible to tell for sure if the Cook County decline was in Chicago proper, suburban areas, or both.